I think this boat could be quite something – a fast 14ft one-man rower that comes out of two sheets of ply. Designed for flat water, you'll notice that in order to reduce the fuss at the waterline to a minimum, I have worked the waterline at the design displacement so that it just kisses the chine. Hopefully, this boat will have a nice clean glassy wake. It's a straightforward tack and tape job, except for the outriggers, which I must say took a considerable amount of thought, though they're far from difficult to make: the outrigger arms are intended to be supported by strong boxes parallel to the boat's sides and braced against its bottom. Their exact length is debatable; I've drawn them with 8 inches of overhang each side on a boat beam of 33.5in, or a total of 4ft 3in - quite a good beam that some might wish to reduce to, say, 4ft or even 3ft 11in. Shorter outriggers will also reduce the leverage on the hull supporting the outriggers. 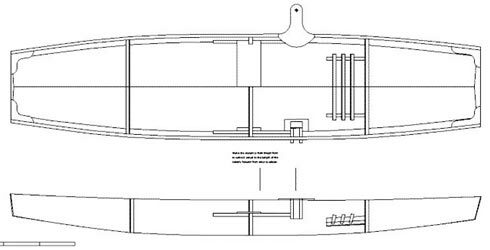 I'd build this boat as neatly as possible using good quality 5 or 6mm marine ply and hope to finish it bright, at least on the inside. In order to save weight and keep costs under control (where I live, epoxy is much more costly than in the US), I would avoid adding epoxy-oaked roving, but the traditional cheap ply faced with epoxy and Dynel is certainly an option.